Among the isolated volcanic islands of the Galapagos, snorkeling in San Cristobal, the easternmost island, offers an incredible opportunity to watch the unique and diverse local marine life of this fragile ecosystem in it's natural environment. Comprised of three or four long-extinct volcanoes that fused together thousands of years ago, San Cristobal is named for the Patron Saint of seafarers, "St. Christopher," and is renowned as the spot where Charles Darwin first came ashore in 1835. By 1880 the island was home to a penal colony for prisoners from mainland Ecuador, and later sugar cane plantations, it is now celebrated for some of the best snorkel sites in these enchanted isles. The nutrient-rich waters surrounding the island are part of the protected area of the world's second largest marine reserve, where San Cristobal snorkeling sites teem with wonders that never fail to impress divers and snorkelers alike. The northwestern edge of the island boasts some of the most popular snorkel sites, such as Kicker Rock and Isla Lobos. A snorkeling tour in San Cristobal will be jam-packed full of the best of what the islands have to offer. With just a snorkel, fins, and a mask, you'll be able to chill with Pacific green sea turtles, wonder at a magenta octopus, paddle around with tiny and overwhelmingly adorable Galapagos penguins, and stare in wonder as local marine iguanas descend from the land to feed on the seaweed. Baby Sea lions and fur seals with stare in wonder as you break away from their underwater games to take a breath, while white-tipped reef sharks lurk on the bottom. The amazing profusion of life just off the shore will leave any snorkeler in awe, with schools of gliding, passing manta rays gliding by, and the hope of catching a glimpse of the biggest fish in the seas, the whale shark. Isla Lobos is named for the good-natured sea lions, as well as fur seals, that live along the shores of the protected coves and small inlets. The clear, calm waters and a white sandy bottom are the backdrop to the sea lion circus where they whizz by and then reappear just a few inches from your mask, just to blow bubbles in your face. On the western side of the island you'll find the horseshoe-shaped white, sandy cove of Ochoa Beach, where sea lions frolic in the calm, shallow water, frigate birds, pelicans and blue-footed boobies cavort on the nearby shore, the Ghost Crab and the Hermit Crab scuttle across the sands. Of the snorkel sites on San Cristobal, Kicker Rock is truly the most dramatic. With a vertical tuff cone (condensed volcanic ash), rising some 148m (almost 500 feet) straight up out of the ocean into a formation that is reminiscent of a sleeping lion, the rocks of the so-called "Leon Dormido" are dotted wtih sea lions, while the Manta Rays, sea turtles, and hammerhead sharks cruise the local waters. Any time of year is a good time to explore the unique wonders of the Galapagos, but from January to May the weather is typically warm and sunny with the occasional brief rainstorm. The ocean tends to be calmer at this time of year and ranges between 20-25C (68-77F), and even sometimes as warm as 27 or 28C (81 or 82F) in some places, if you are lucky, so you'll probably not need anything more than a rash guard while snorkeling, but as some sites can have cool water currents flowing through, a shortie wetsuit can be a good thing to have to be comfortable on long snorkel tours. These are the best months for a chance to spot manta rays or even glimpse a couple of hammerhead sharks down below in the deep blue. June to December is the cooler, dryer "garua" season, when the sea can be a bit choppier thanks to the effects of the cool Humboldt Current, with water temperatures usually 19-23C (66-73F). This is also the time of year when many migratory birds visit the islands, while beneath the waves sea mammals tend to be most active, and it's the peak time for whale shark encounters and the possibility of sighting the bizarre Mola mola cruising along. 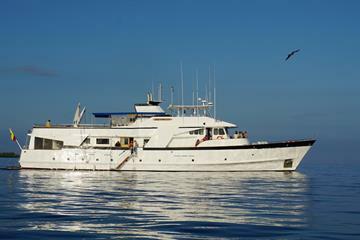 How Do I Get To San Cristobal, Galapagos? To get to the Galapagos Islands you'll fly into either of the international airports on mainland Ecuador, Mariscal Sucre International Airport (UIO) in the capital Quito, or Guayaquil's Olmedo International Airport (GYE). If in doubt, Guayaquil is your best option as Quito flights to the Galapagos make the stop in Guayaquil on route. There are several flights each morning from the mainland direct to San Cristobal Island for your snorkel adventure, or for liveaboard tours of the islands, you'll most likely fly into the airport on Isla Baltra, connected to Santa Cruz and a hour bus ride from Puerto Ayora, where you'll board your yacht. You may want to leave any excess warm clothes for the heights of the Andes in storage in Quito or Guayaquil, as you are limited to 20kg (44lbs) of checked luggage on the Galapagos flights.